I made this card for a challenge posted n Stacey’s blog. She had a color challenge that I just loved! The inspiration photo had a lot of white with the pops of color, so that got me to my card. Since she is an SU demo, I wanted my card to be an SU-only card (not a requirement, especially as I am doing this for my own fun, but hey, its a challenge 😉 ). 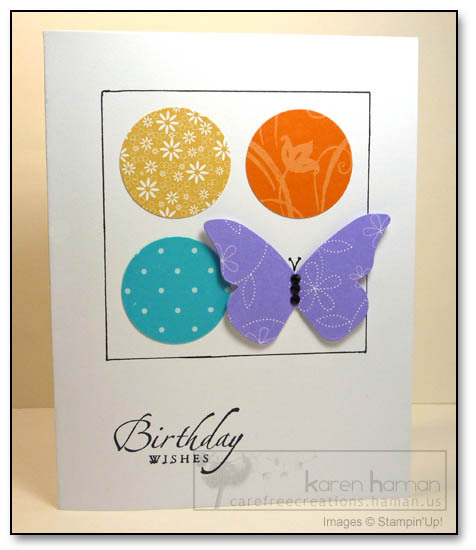 I don’t own a lot of current SU sets – so I opted for spots of color and I used my new Butterfly die. I cut scrap paper the right size and used it as a template to draw my box. I stamped the greeting. The final touch was black rhinestones. All supplies Stampin’Up! unless otherwise noted. This entry was posted in cards, Stampin Up by karen h. Bookmark the permalink. how fun. love those colors and the pattern together 🙂 great card! What a great CAS card! I love how the colors just pop off the white background! A super card – love how it’s so simple, yet so very WOW. Great job.